St. Catharines residents can celebrate with fireworks and backyard barbecues over the Canada Day long weekend. But, St. Catharines Fire Chief Dave Wood cautions revelers to be safe and follow the City’s rules for using fireworks and backyard cookouts. The fire chief said residents are allowed to use commercial fireworks on their property on Canada Day (Saturday, July 1), the day before (Friday, June 30) and the day after (Sunday, July 2). Fines for violations to the City’s fireworks by-law are $300. Instead of setting off fireworks at home, Wood recommends residents enjoy the Port Dalhousie Lions Club’s fireworks display, taking place Saturday, July 1 at 10 p.m. Residents can view the fireworks from Rennie Park, Jaycee Park and the surrounding area. Admission is free. Access to Henley Island will be closed during the fireworks show. 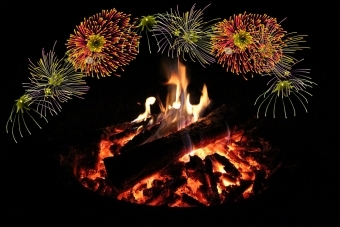 Should residents choose to create their own fireworks display, the fire chief recommends residents follow these safety tips: only use fireworks outside, always read and follow directions, have a bucket of water or garden hose nearby, set off fireworks a safe distance away from structures, and never throw or point fireworks at other people, trees, buildings or other structures. Only licensed businesses that have a City Consumer Fireworks Sales Permit are allowed to sell fireworks in St. Catharines for Canada Day. Residents should only purchase fireworks from businesses that have a posted permit from the fire chief. The fire chief reminds residents they can enjoy backyard cooking fires as long as they meet certain safety requirements, such as being contained in small pits covered with a grill and located at least three metres away from buildings, trees, fences and other structures. Residents must always have a way to put out the cooking fire within reach, such as a bucket of water or fire extinguisher, and fires must be extinguished immediately after use. Cooking fires must never be left unattended. Residents must properly dispose of cigarette butts, matches and other smoking materials in deep, sturdy ashtrays or another fireproof container. The fire chief advises smokers not to discard cigarettes in planters or potting soil. Commercially-sold planters and soils can be made of a combination of peat moss, shredded wood, bark, perlite, vermiculite, fertilizer and even Styrofoam pellets, and an improperly discarded cigarette can easily start a fire when these mixtures dry out. The fire chief offers these other tips to help reduce the risk of fires caused by unsafely discarded smoking materials: never smoke while using medication or alcohol, never leave lit cigarettes unattended and never throw them out of your car window. Visit www.stcatharines.ca/FireSafety for more information about fire safety. Report unsafe use of fireworks, vendors selling fireworks without permits and inappropriate backyard fires to St. Catharines Fire Services at 905.684.4311.